Add this recliner to your home theater or living room for a modern and contemporary style. 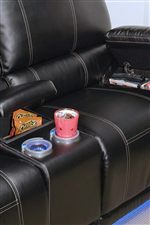 Memory foam cushions on on the seat and back make it easy to kick back and enjoy your favorite movie in comfort. 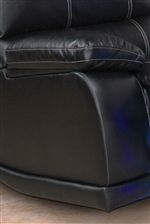 The Mesa Black color bonded leather upholstery accentuates the clean lines and contrast stitch accents. This chair is available in power and non-power options. 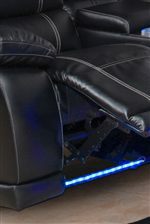 The Electra Contemporary Glider Recliner with Pillow Arms by New Classic at Casa Leaders Inc. in the Wilmington, Long Beach, Torrance, Lakewood, Los Angeles area. Product availability may vary. Contact us for the most current availability on this product. The Electra collection is a great option if you are looking for Contemporary furniture in the Wilmington, Long Beach, Torrance, Lakewood, Los Angeles area. Browse other items in the Electra collection from Casa Leaders Inc. in the Wilmington, Long Beach, Torrance, Lakewood, Los Angeles area.